Spectroscopy is the study of the interaction between matter and radiation and spectroscopic methods measure this interaction by measuring the radiative energy of the interaction in terms of frequency or wavelength or their changes. A variety of spectroscopic methods saw their first applications in mineralogical studies in the early 1960s and 1970s and since then have flourished where today they are routinely employed to probe both the general nature of mineralogical and geochemical processes as well as more atom specific interactions. 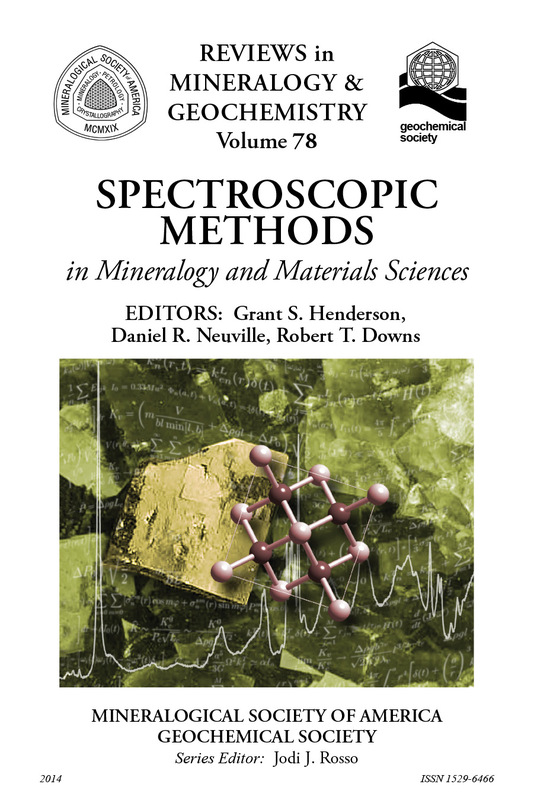 In 1988, a Reviews in Mineralogy volume (Volume 18) was published on Spectroscopic Methods in Mineralogy and Geology by Frank Hawthorne (ed). The volume introduced the reader to a variety of spectroscopic techniques that, up to that time, were relatively unknown to most of the mineralogical and geochemical community. The volume was a great success and resulted in many of these techniques becoming main stream research tools. Since 1988, there have been many significant advances in both the technological aspects of these techniques and their applications to problems in Earth Sciences in general while the range and breadth of the techniques currently employed have greatly expanded since those formative years. The current volume compliments the original volume and updates many of the techniques. In addition, new methods such as X-ray Raman and Brillouin spectroscopy have been added, as well as non-spectroscopic chapters such as Transmission Electron Microscopy (TEM) and Atomic Force Microscopy (AFM) for completeness. The first chapter by Lavina et al. introduces the reader to current X-ray diffraction methods, while those of Newville and Henderson et al. separately cover the widely used techniques of EXAFS and XANES. The new in situ high-pressure technique of X-ray Raman is covered in the chapter by Lee et al. There is an emphasis in all these chapters on synchrotron based methods which continues in the Luminescence chapter by Waychunas. 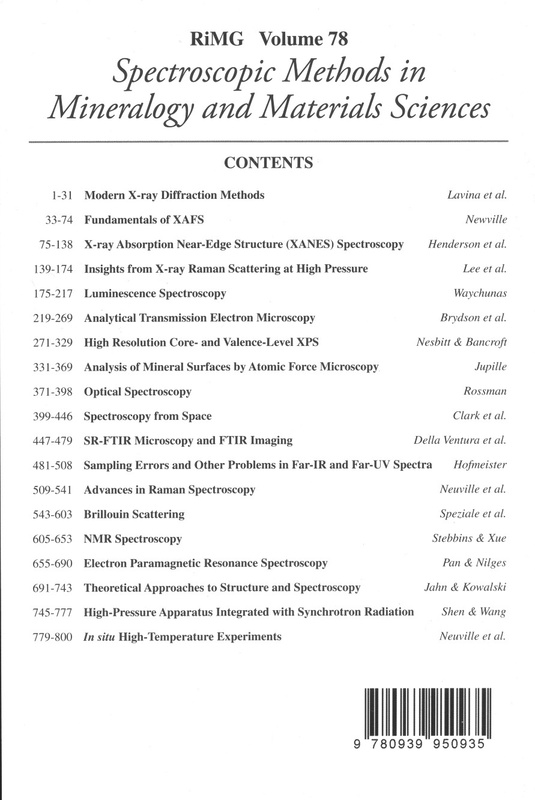 Chapters on high resolution TEM and its associated spectroscopies, and X-ray photoelectron spectroscopy are covered by Brydson et al., and Nesbitt and Bancroft, respectively. The study of mineral surfaces by Atomic Force Microscopy has been covered by Jupille. UV/Vis and IR spectroscopies are described in the chapters by Rossman, Clark et al., Della Ventura et al., and Hofmeister. Rossman’s chapter covers the basics of UV/Vis while Clark et al. describes the detection of materials in the Solar system utilizing UV and IR methods. Synchrotron-based IR imaging is covered by Della Ventura et al. and errors and uncertainties associated with IR and UV/Vis data are covered in the chapter by Hofmeister. Photon/phonon interactions such as Raman and Brillouin are outlined by Neuville et al. and Speziale et al. The latter technique is relatively new outside the fields of condensed matter and minerals physics but is gaining increasing use as interest in elastic properties and anomalous behaviors at high pressure continues to grow. The chapters by Stebbins and Xue, and Pan and Nilges outline the current status of magnetic resonance methods such as NMR and EPR, respectively. Finally the last three chapters have been included for completeness and cover the basics of the theoretical simulations that are carried out to investigate phases beyond accessible experimental pressure-temperature ranges, as well as aiding in the interpretation of experimental spectra (Jahn and Kowalski), the high pressure methods that are now commonly employed for many spectroscopic studies (Shen and Wang) and finally a chapter on methods used in high-temperature melt and crystallization studies (Neuville et al.). Robert T. Downs, University of Arizona, U.S.A.